Darkmook Paper Miniatures has released their new Survival Horror tabletop game and is running a special over on RPGNow. 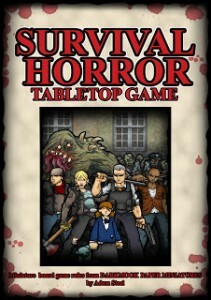 The 56 page SURVIVAL HORROR TABLETOP GAME pdf contains all you need to enter the world of 30mm scale tabletop Modern Horror gaming! Pit survivor against zombie and mutated Bio Weapons and see who will survive! Just print, construct and add dice! Available to purchase at RPGNow!